“News of the World” is a work that, despite its historical trappings, deals intimately with important contemporary issues. I think that modern readers will find much to relate to in the story and the characters, despite some strange grammatical decisions on the author’s part (the lack of quotations for speaking parts in the novel is an almost ubiquitous complaint among readers I’ve encountered). 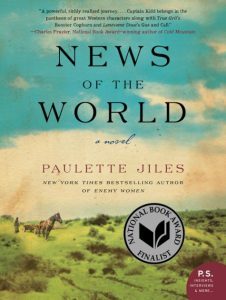 Written by Paulette Jiles, “News of the World” centers around two characters: Captain Jefferson Kyle Kidd, an aged, traveling news reader, and Johanna Leonberger, a 10-year-old captive of the Kiowa Indian tribe. Tasked with returning Johanna to her relatives in San Antonio, Captain Kidd must brave the barren, lawless landscape of post-Civil War Texas, all the while trying to befriend and understand the child. It is this relationship that serves as the emotional bedrock for the story, and allows for the first point of contemporary connection. We live in a world in which refugees and illegal immigrants are often rejected from asylum due to fear of cultural and ethnic otherness. The relationship between the Captain and Johanna provides a poignant example of how important understanding and empathizing the other – instead of fearing them – can be. When he first meets her, Captain Kidd is openly nervous around Johanna, fearful of the possibility of her killing either him or someone else. He does not understand her strange “savage” behavior and cannot communicate with her outside of a few bits of Indian sign language, yet he overcomes this estrangement by attempting to understand Johanna and her plight. Echoing the advice of Atticus Finch, Captain Kidd puts himself in Johanna’s shoes, understanding that she is not some violent threat but rather a scared child, trapped between two cultures. The Captain finally sees Johanna as human. The other central conflict of the story, between the politically divided citizens of an 1870s Texas, provides another clear modern analogue. “News of the World” presents a country where the very discussion of the facts of the day is controversial and can even lead to violence. Sound familiar? What’s really interesting about this is the way that the novel comments on the challenge of trying to bring both order and truth to a divided people; Captain Kidd attempts to bring both to his listeners. His fluff pieces, though they do assuage the weary minds of his listeners, don’t bring truth to them. And his very presence and commitment to not to “choose a side” in what he is reading only angers his more radical patrons, leading to a fight at one of his readings. In this divided era of “fake news” that we find ourselves now, Captain Kidd’s struggle to spread peace and truth in his world is relatable. I think that most of us would like a world that isn’t so contentious and violent, but it’s simply not that easy. Just as the Captain and Johanna wandered through the thorny lawlessness of Texas more than 100 years ago, we too must wander through our current divided American landscape. However, we can learn a lot from their example as well. We can continue to seek the truth and to strive for an end to civil strife. We can learn to understand and empathize with our neighbors, no matter how strange or foreign they may be. But more than anything we can learn to stay true to both ourselves and the ones we love.